Many horror movies were released in the 1980s, some great, some awful. The ones that made money usually had at least one sequel made, and in the case of 1980's Friday the 13th and 1984's A Nightmare on Elm Street, they became full-blown franchises with new movies released every year or so. Both of these have been released in DVD sets with their initial offerings together. This Blu-Ray set of the seven "Elm Street" films is comprised of discs that were previously released separately, although only the ones containing the first through third movies have previously been available in the US. The set has been available previously in the US as a Best Buy exclusive but is now available through other retailers as well. The basic premise for this series is that Freddy Krueger (played by Robert Englund in all movies) is tormenting and ultimately killing groups of teenagers in the fictional town of Springwood, Ohio. The twist here that separates Freddy from other horror movie killers is that he attacks his victims in their dreams- while they are asleep, he appears in their nightmares and whatever he inflicts upon them there happens to them in real life. 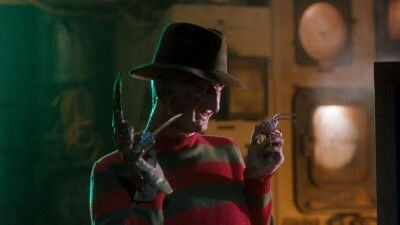 Freddy's weapon of choice is a glove with knives on the end of each finger, and a telltale sign that he's been in your nightmare but you've managed to escape him alive is that you will wake up with slashes on your clothing or skin. If someone happens to be watching you sleep as he's attacking you, they'll see the slashes appear on you out of nowhere, and they may end up watching you die if they don't wake you up! In the movies we usually experience the nightmares from the dreamer's end, allowing for interesting set pieces which get more creative as the films progress. Freddy's backstory is that before he became supernatural, he kidnapped and killed several children in Springwood. He was caught but let go on a legal technicality. The town's furious parents took matters into their own hands and tracked him down, ultimately burning him alive (this is why Freddy has severe burns all over him in the movies.) While this killed him in the real world, he has returned through the dreams of these parents' surviving children. The first movie in the series, A Nightmare on Elm Street (1984) introduces Freddy and the premise that continues through the following five movies, but easily stands on its own. It opens with Tina (Amanda Wyss) being scared but not harmed by Freddy- she wakes up realizing it was just a dream but is disturbed by it more than usual. Later she tells her friend Nancy (Heather Langenkamp) about her nightmare and finds that Freddy has also been in Nancy's recent dreams! Tina spends the night with her boyfriend Rod (Nick Corri) and dreams about Freddy again, but this time he kills her- Rod wakes up and watches her in the real world being pulled along the walls and ceiling by an invisible force and then hacked to pieces. 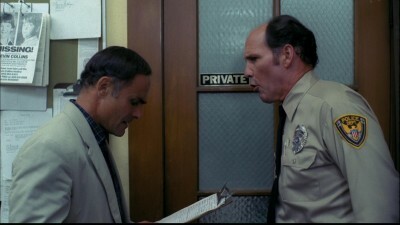 Rod's first reaction is to escape- dumb move, as he's immediately blamed for the murder and eventually found and thrown in jail by Nancy's father (John Saxon), who is a police lieutenant and of course doesn't believe the whole Freddy story. Meanwhile in the dream world, Freddy continues to torment Rod, Nancy and their friend Glen (Johnny Depp, in his first movie role), who lives across the street from Nancy. I was already a pretty big horror fan when A Nightmare On Elm Street was released in 1984 and was intrigued by its TV spots, although not being old enough to get into R-rated movies I had to wait about a year when it began playing on cable and I saw it at a friend's house as I didn't have cable at home. Having seen most of the Friday the 13th movies, I remember being a bit disappointed during my first viewing of "Elm Street" as it spent too much time on plot and I just wanted to see people get killed. Of course I've grown to appreciate it much more since then (watching it on my own rather than with friends complaining how long it's been between kills), as I've learned there's more to horror than people getting hacked up. While Friday the 13th's Jason was a rather one-dimensional character (he's never spoken a word in about eleven movies), Freddy laughs at and taunts his victims. In Tina's dream, before he gets to killing her he first enjoys her reaction to the scraping sounds he makes with his glove-knives, and then says "Watch this!" and further enjoys her being disgusted and screaming as he hacks the fingers off of his other hand with his glove and makes green blood spurt out. (Freddy gets more lines in each subsequent movie.) The movie's whole concept is rather intriguing as well- what if events in your dreams really happened to you, and would you be able to control them? Writer/director Wes Craven mentions in the extras that one of the inspirations for A Nightmare on Elm Street was a real-life story he'd heard of a man who died in his sleep, supposedly because of a dream he had. 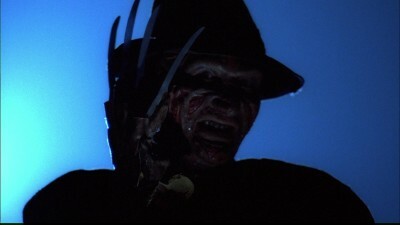 Freddy came from memories of a scary old man whom Craven had seen outside one night from his bedroom window. Interesting about A Nightmare On Elm Street's production is that it was partially financed by Media Home Entertainment, which was the second company formed (after Magnetic Video) in the late 1970s to license theatrical movies for release on videocassette (the major studios were comparatively late to that party as they did not foresee much of a market for that existing, although 20th Century Fox ended up purchasing Magnetic Video and ironically distributed Media Home Entertainment's titles in its final years.) Media of course had already issued many other small horror movies on home video by 1984. The movie ended up being very successful and of course conventions of the time pretty much demanded a sequel, thus in 1985 A Nightmare on Elm Street Part 2: Freddy's Revenge was released. Although it came out only one year later than the first movie, the story takes place five years afterwards, in the same house Nancy lived at but now a new family has moved in. (Things certainly look far closer to 1985 than 1989.) Their son Jesse (nice name!) ends up in Nancy's old bedroom, and finds that she has left a few things behind, including her diary of the first movie's events. Freddy soon comes into Jesse's dreams and tries to take over his body in order to do some more killing, while also messing with the house's air conditioning system. In a memorable encounter where Freddy makes his proposition, he tells Jesse "You've got the body, I've got the brains" and proceeds to slice his own head open to give him and the audience a nice look at those brains. Jesse fits in nicely in the neighborhood, making friends with a potential enemy named Grady (Robert Rusler) and then attracting Lisa (Kim Myers), but Freddy's also got his eye on them, and meanwhile a few other mysterious killings occur and Jesse can't quite be sure if he's to blame for them or not. Things come to a head when Lisa holds a pool party at her house, and Freddy first makes the water boil and then appears in the backyard setting fires, attacking everyone and spoiling the festivities. Over the years, Freddy's Revenge has widely been the least-regarded of the "Elm Street" series, mainly because it violates so many of the "rules" that the first and subsequent films would follow. Mainly, Freddy is not supposed to appear to a large group of people in real life as he does at the party here. Still, I've always found it reasonably entertaining, and now the dated 80s fashions make it all the more so. Given how few movies give their hero the same first name as mine, I have to appreciate when this does happen. The town of Springwood is mentioned by name here for the first time in the series. 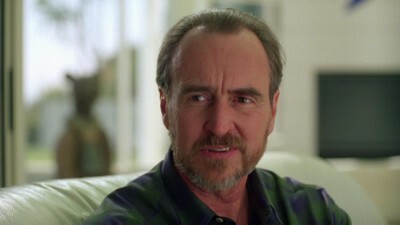 Although creator Wes Craven refused to have any part in the second movie, he returned as a co-writer and co-executive producer for 1987's A Nightmare on Elm Street 3: Dream Warriors, also co-written by Frank Darabont. Here the series gets back on track and introduces more fantasy elements and more elaborate special effects than the previous two movies. Although another set of new characters are introduced, Heather Langenkamp returns as Nancy, who has now become a psychiatrist. John Saxon also returns as her father, who has left the police force and now spends most of his time drinking. The main character here is Kristen (Patricia Arquette), who gets a visit in her dreams from Freddy and placed in a youth asylum after he makes her appear to attempt suicide. The other "troubled youths" in the group she's placed in also have Freddy to blame for most of their troubles. With Nancy's help, Kristen learns to pull the other kids into her dreams and they band together to fight back against Freddy. Since this is still a horror movie, Freddy manages to kill a number of them before the film is over, and Nancy's efforts to help the kids are met with interference from other staffers who don't believe the whole Freddy story. 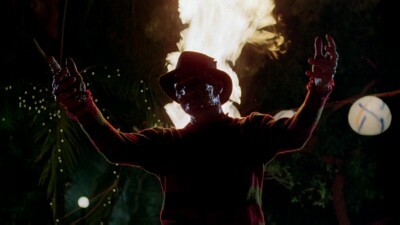 A number of elements are introduced in Dream Warriors, including the backstory of Freddy's mother- a nun who was mistakenly locked in part of the asylum and raped by the inmates, hence the "son of a hundred maniacs" taunt in the series' sixth entry. The fictional drug Hypnocil is also introduced here- a dream suppressant which was also a large element of Freddy Vs. Jason years later. Overall, Dream Warriors is one of the 'smarter' entries in the Elm Street series, giving a clearer understanding of Freddy and his strengths and weaknesses. Freddy Krueger had become a horror icon by this point, so of course he had to return in 1988's A Nightmare on Elm Street 4: The Dream Master, notable for being one of director Renny Harlin's earlier efforts and also Brian Helgeland's first writing credit. This one starts out with the surviving characters from Dream Warriors, although Patricia Arquette is replaced by Tuesday Knight as Kristen. Kristen ends up with a boyfriend named Rick (Andras Jones), whose sister Alice (Lisa Wilcox) eventually becomes this film's title character (gaining Kristen's ability to pull people into her dreams) and a key element of the fifth movie as well. It turns out that Kristen is the last of the original "Elm Street children" whose parents had torched Freddy and put him into his present state, and now Freddy needs her to lead him to new victims. A new element here is that Freddy has been literally collecting the souls of all his victims- one effect has him revealing his chest where many of their faces are embedded within it, screaming out to be freed. Although this entry stretches things a bit in order to keep the franchise going, it's still lots of fun with some innovative special effects and increasingly surreal situations. 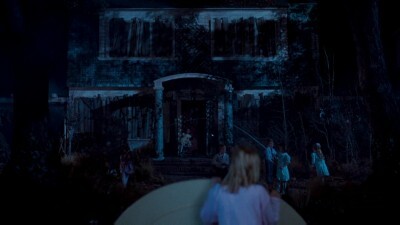 Alice's adventures continue in A Nightmare on Elm Street 5: The Dream Child, released the following year in 1989. It's graduation time, but a damper is put on things when Freddy takes out Alice's boyfriend Dan (Danny Hassel) in one of the series' most creative kills- Danny falls asleep while riding his motorcycle and Freddy fuses him to it as a sort of cyborg contraption. 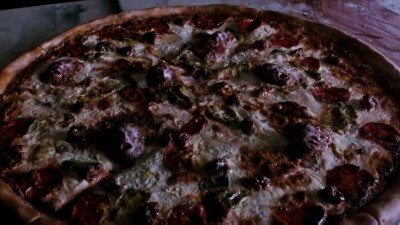 Afterwards, Alice learns that she's pregnant with Dan's child, and Freddy wants to claim it as his. Alice checks into a hospital to make sure this won't be a repeat of Rosemary's Baby, but she has dreams about Freddy controlling her future child and meanwhile Freddy also creeps into her friends' dreams with fatal results. 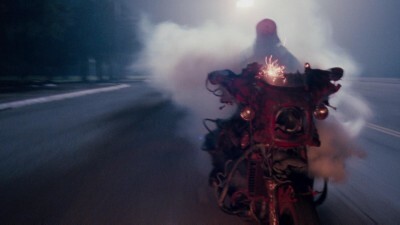 The Dream Child was criticized by many as being "darker" than the previous entries. I found the child concept another indication of the series stretching itself a bit for ideas, and wonder how Alice managed to make so many new friends for this movie, since most of her main friends were killed off in the last one? Still not a bad movie by any means. It was initially released in two separate versions on home video- the R-rated theatrical version and an unrated cut with scenes that supposedly had to be excluded to avoid an X rating. The theatrical cut is the only version included on this Blu-Ray set and also the only version that has been released on DVD as well. (Almost) finally, we have 1991's Freddy's Dead: The Final Nightmare. Without spoiling too much, this was marketed from the get-go as being true to its title. I've always found it the most cartoony of the "Elm Street" movies, which has been considered a good thing by some and a bad thing by others. New characters make up this one, with a "John Doe" (Shon Greenblatt) showing up in a town outside Springwood and dumped at the "Recovery House Youth Shelter" by the police when he can't remember who he is- opening text tells us he's the last surviving teenager in Springwood. 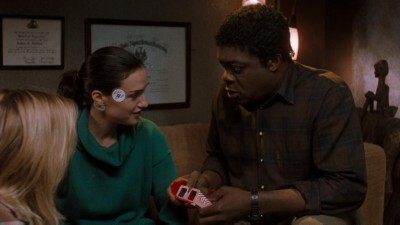 Maggie (Lisa Zane), a counselor at the shelter, tries to help John figure out his identity and discovers she has ties to Freddy herself. They take a trip back to Springwood, where they find many older people (including then-married Roseanne and Tom Arnold in a brief appearance) dazed and talking to themselves- quite a departure from the Springwood of the previous movies. Some other kids from the shelter stow away in the van with Maggie and John and are found out too late to bring htem back, so they get to join in the fun and eventually have Freddy invade their dreams as well. 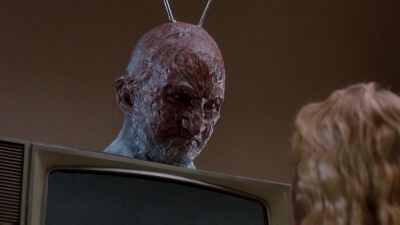 When they stop for the night in an abandoned house, Freddy takes Spencer (Breckin Meyer, in his first movie appearance) into an old Zenith TV and ends up placing him in a video game with Freddy at the controls. Again, things get rather cartoony. Anyways, despite the color distortion, it was the first time 3D had been seen theatrically in several years and worked adequately, although no other movies of that era ended up using it. Being a long-time 3D fan, I felt at the time that it was certainly better than nothing. 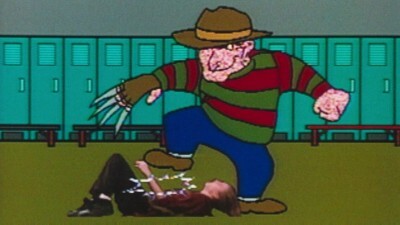 When Freddy's Dead was released on VHS a few months later, the 3D sequence was only presented in 2D, while the laserdisc included it as an extra after the entirely 2D presentation. When "The Nightmare on Elm Street Collection" DVD set was released in 1999, 3D glasses were included with it and Freddy's Dead could be viewed as it had been in theaters, with the 2D version of the scene also included using the DVD's alternate camera angle function. Sadly, this Blu-Ray set only includes the 2D version. While including the anaglyph version here would not have looked as good as the modern Blu-Ray 3D format, it still would have been faithful to the theatrical presentation. Viewed in 2D, the sequence just looks silly, as the sense of depth when Maggie puts the glasses on is lost, and the overall cheesiness, including some special effects that are rather dated-looking, becomes all the more apparent. In 1994, Wes Craven's New Nightmare was released. Immediately I feared it would be a shameless excuse to continue the series after they had already declared it done, just as Friday the 13th: The Final Chapter, which was originally supposed to have ended that series, was followed up with A New Beginning and several more sequels after that. However, New Nightmare presents a concept that was very original: It isn't a continuation of the previous movies, but rather is about the REAL filmmakers and actors (including Wes Craven, Heather Langenkamp and Robert Englund, playing themselves) in the real world, with Freddy (also played by Englund again, but he's not the same character as the real Robert Englund in this film) coming into that real world. Heather Langenkamp is the primary character here, although some elements like her husband and son are fictionalized. Heather is married to Chase (David Newsom), a special effects artist and they have a son named Dylan (Miko Hughes, who horror fans already knew as Gage from Pet Sematary. I've always wondered if he's been affected at all from performing in horror movies at such a young age.) Heather is approached by Wes Craven and then-head of New Line Cinema Robert Shaye to star in a new "Elm Street" movie, but she isn't quite sure if that's a good idea. She's been disturbed by a number of crank calls to her house by someone using a Freddy voice- only it turns out to really be Freddy calling her and entering the real world! 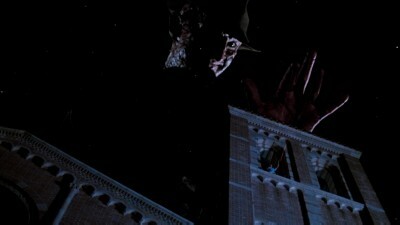 Early in the movie Freddy kills Chase and then begins haunting Dylan, forcing him to be hospitalized. It's very rare for movies to take this direction into the real world, and I always enjoy it when they do. New Nightmare came out a couple years before I discovered the internet, so it was refreshing to get this sort of perspective on the "Elm Street" franchise, and I felt smarter than most of the others who saw this movie since it seemed very few of them even read credits or knew who Robert Shaye even was. I haven't read much internet discussion of this movie, but I assume had it been released today it would have triggered much conversation and arguing over what was realistic or not about it. New Nightmare of course paved the way for Wes Craven's next franchise Scream (1996) which although fictional still involved the filmmaking world, but somehow those movies never worked for me as well as this did. New Nightmare is played and shot mostly in the style of a conventional drama (including many bright scenes in the real world), which makes it easy to accept it as an account of the actual people involved in the "Elm Street" movies even though the events are obviously fictionalized. 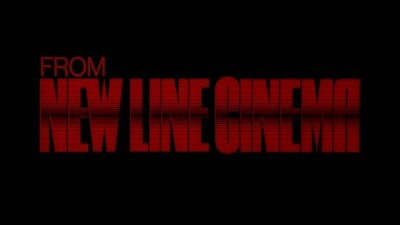 All seven movies are presented in 1080p high definition, at a full-screen 1.77 aspect ratio. The previous DVD set presented them closer to 1.85, but it appears the frames have simply been opened up here as nothing looks cropped or cramped. The first movie appears to have a bit of clean-up done compared to older transfers, the rest look clean but still close to their original looks. Each movie's theatrical trailer is included, in 16x9 standard-definition and remixed in 5.1 sound (quite a feat, as most movie trailers of this era were originally in mono.) Each movie also includes a number of interview clips with the cast and crew, originally made for the 1999 DVD set. Three music videos of songs that appeared in the movies by Dokken, the Fat Boys and Whodini are included as well (the "Dream Warriors" video by Dokken was included on the original VHS release of the third movie, rather innovative for the time.) All of these are included on the respective disc of the movies they refer to. A standard DVD is included with more extras: a retrospective documentary "Fear Himself: The Life and Crimes of Freddy Kreuger" (produced in 2011, after the original DVD set) narrated by Robert Englund is included although it does not include much information not discussed in previous extras. There are two groupings of more cast and crew discussions originally found on the "Nightmare Encyclopedia" disc in the original set, and two episodes from the 1988 syndicated TV series "Freddy's Nightmares" which has not been released on disc before. The first movie includes two audio commentaries- the first with director Wes Craven, Cinematographer Jacques Haitkin and stars Heather Langenkamp and John Saxon, originally made for the 1990s Special Edition laserdisc from Elite Entertainment and also included on the older DVD set. The second is a number of additional comments with cast and crew edited together. New Nightmare also includes a commentary track with Wes Craven, originally included on the movie's laserdisc release. This was one of the first audio commentaries I ever listened to and includes a lot of great information. The Nightmare on Elm Street series certainly belongs in all horror fans' collections. The 1999 DVD collection was a monumental release, and while this Blu-Ray set's packaging and presentation aren't quite as innovative as that was, the movies look and sound better than ever and is a worthy upgrade.